Good things come in small packages…just ask Denver Broncos fans. Last month, during the pre-season home game of the NFL Denver Broncos, the Mile High Monument made its debut. Located on the exact spot where the original Mile High Stadium once stood, this permanent 3,000-square foot structure is approximately 1/8 the size of the original stadium. Built to honor the history of the place the Broncos’ called home from 1960-2000, the monument offers fans a look back at the history and greatest moments of the Mile High Stadium. A miniature Bucky, replica South Stands Bleachers and 165 of the original seats are just a few of the familiar sights of the old stadium. Greatest moments in Broncos’ history will be showcased for visitors on a giant video screen. The six foot high, white double wire fencing & gates used in the Mile High Monument were provided by Omega II Fence Systems. 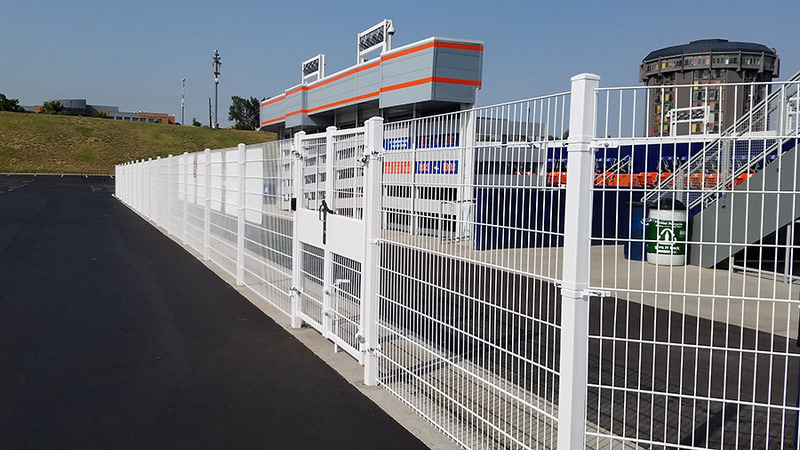 Designed for areas with heavy public usage and to satisfy a greater need for protection, the rigid and contemporary ELITE fence system was the perfect match. Detailed engineering, tight timelines for manufacturing & significant teamwork were requirements successfully met by Omega II throughout the scope of the project. “It’s been a dream of management … for several years to pay homage to what everyone loved,” said general manager Jay Roberts, in a recent Denver Post article. The idea is for Broncos fans “to sit in the old stadium and memories will come flooding back,” he said. The monument is free and open to the public, and will be open for tours on non-game days.